Ben Barker was in superb form at Sheffield. Panthers supremo Ged Rathbone insists his team are ready for anything bitter Premier League play-off rivals Sheffield can throw at them on Sunday. 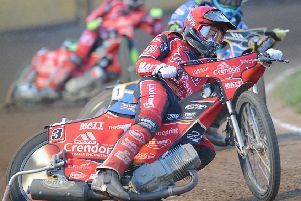 The two clubs clash at the East of England Showground (5pm) in the second leg of what has descended into a quarter-final feud. Panthers will take to the track in possession of a 46-44 aggregate advantage after a stunning first-leg triumph at Owlerton last Thursday when they ignored off-track shenanigans to shine on the shale. Relations between the two clubs could hardly be frostier ahead of the return battle after Rathbone claimed he was blanked by Tigers chief Damien Bates at a British Speedway Promoters’ Association (BSPA) meeting earlier this week. He said: “Damien didn’t even acknowledge me at the meeting, but that doesn’t surprise me after last Thursday. “I was escorted away from the pits three times by security because the Sheffield promotion were more interested in playing silly games than running a speedway meeting. “We also had mechanics blocked from going into the pits as they tried to make it as hostile as they possibly could, but we rose above it and I’m hugely proud of the riders for the performance they delivered in such circumstances. “We are certainly not going to stoop to those levels of pettiness on Sunday. We will show the Sheffield management and riders the correct conduct which should always be displayed to opponents. Rathbone has launched a ‘Target: 2000’ campaign as he bids to pack the Showground for the second leg. The North-East based businessman has been delighted with crowd levels during his first season at the helm after stepping in to save the club last winter. But he is ambitiously attempting to double his regular attendance to create a ‘carnival atmosphere’. Rathbone added: “Our crowds have been hovering around the 1,000 mark for the majority of meetings and that is a big increase on last season. “But I really want to see the place packed on Sunday. Hopefully the people of Peterborough - and the surrounding areas - can turn out in force to help us take the next step towards the title. Panthers bosses are still to decide whether to draft in a guest or operate the rider replacement facility at number one. They have few options with three likely candidates to step in - Ricky Wells, Rohan Tungate and Nicklas Porsing - all unavailable. Anders Thomsen does return after missing the first leg due to sickness. Sheffield number one Jason Garrity is a major doubt due to a suspected broken foot sustained when riding for Coventry in the Elite League play-offs.